There’s nothing like going for a walk in the winter weather with your dog. It’s important to prepare for the cold weather and ensure your dog is kept wrapped up and warm throughout the winter season. Here’s our guide on how to keep your dog warm on your winter walks. Although a human cold cannot be passed onto a dog, dogs can in fact catch various respiratory infections. The risk of acquiring infections is increased if your dog has lots of close contact with other dogs, for examples if they’re housed in kennels for a period of time. However, canine influenza is quite rare and only a few cases have been identified in the UK. We have pieced together our top tips to help keep your dog safe, happy and healthy during the cold winter months. Dog coats aren’t just about your dog looking good. They’re actually essential for some breeds to keep warm in the winter. Small breeds or short-haired dogs don’t have long enough coats or enough body heat to naturally stay warm. Puppies and older dogs can also find it hard to control their body temperature. Whether it’s a waterproof dog coat, or a cosy jumper, it’s sure to help keep your dog warm. Why not have a few coats on hand so you can alternate between them for walks. To work out what size coat your dog will need, measure them from the base of their neck to the base of their tail. A dog can lose much heat through the soles of their paws. As well as keeping your dog’s paws warm, dog boots can protect your dog’s paws from sharp objects on the floor and help to provide grip in icy conditions. Make sure you give your dog time to adjust to their boots if it’s their first time wearing them. If your dog shows any signs of upset wearing the booties, you should take them off immediately. If your dog is unable to wear boots, make sure to wipe their paws after every walk. This helps to protect them from snow, ice or salt build up, and any toxic chemicals such as anti-freeze and de-icers. Anti-freeze and de-icers can be poisonous for your dog. You should check your dog’s pads regularly for any injuries as ice and snow can cause painful cracks and bleeding. Trimming the hair between their toes can also help to prevent ice build-up. There’s only so much time you can spend outside in the cold before seeking the sanctuary and warmth of your home. Dogs feel the same. A dog’s body can lose heat very quickly. Even the thickest fur coat can’t protect all body parts of your dog for a long period of time. Frostbite can occur when a dog is exposed to extremely cold temperatures for long periods of time. The symptoms can vary depending on your dog’s size, age and thickness of fur. Typically, extremities such as the tail or toes are affected and can become ulcerated or discoloured. If your dog is shaking or starts to shiver, it’s a sign your dog is too cold and needs to go home. You should immediately cover them with a blanket and rub them to get circulation and warmth into their body. 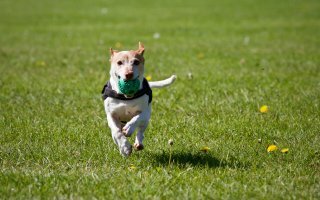 Instead of going outdoors for exercise, you can also exercise your dog indoors by playing games such as tug of war and fetch. If you are concerned about your dog’s health, you should seek advice from your vet. You should keep your dog’s coats longer in winter as their coat is a natural protection against the cold. Brush your dog’s coat regularly too, as matted hair does not insulate your dog as well as smooth hair does. Most young dogs don’t need their coat cutting as often as adult dogs, but you might still want to keep their fur neat as part of their winter grooming routine. Continue to comb out knots with thorough brushing but try to avoid clipping or cutting the coat. You should, however, keep the hair around the paw pads well-trimmed. This will help to prevent a build-up of debris, which can make walking painful for dogs. If you bathe your dog outside, switch to indoors during the winter – and keep the water warm. During particularly cold snaps, consider reducing the number of baths you give them. Dry your dog as quickly as possible and keep them warm until they are fully dry. 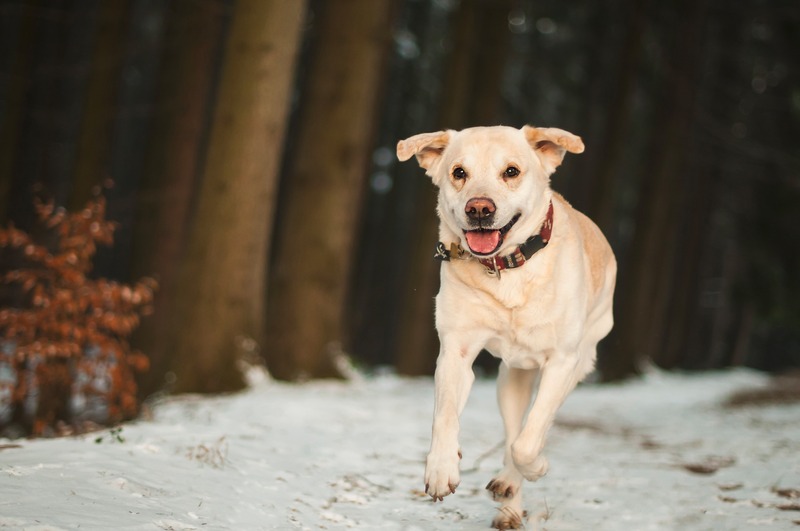 A dog’s dietary requirements might change in winter. This could be quite subtle but it’s something you should be aware of. If your dog is using more energy to keep warm, they may want to eat a little extra and more fulfilling food. Ensure your pet has a good quality balanced diet, which can help to keep them healthy no matter the weather. Choosing the right dog food for your canine is important; a complete and balanced dog food is required to support healthy immune function. When you venture outside with your dog, keep an eye on them for any signs they might be cold. Exposed areas such as tails and the tips of their ears can be particularly susceptible to the cold. Make sure to check them regularly, even if you have returned to the warmth of your home, your dog may still be a little uncomfortable and cold. Should your dog become unwell in the winter months, make sure they’re covered with dog insurance.